I have been keeping Marines for about 4 years; and I wanted to ask your opinion on keeping sharks in an aquarium. I have recently dismantled my last tank and I have room for an aquarium that is 108 x 48 x 48 inches that I will have custom made, it will back on to my garage so all equipment and maintenance can be done in there. I would really like to keep shark(s) in this system- particularly a black tip reef. Is a system this size large enough for a black tip reef shark? And if not what other shark choices would you suggest for the home aquarium of this size? 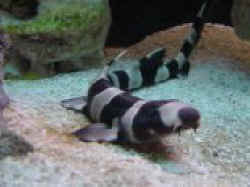 And though they have celebratedly low metabolisms, sharks are very sensitive to pollution, including the nitrogenous wastes (ammonia, nitrite, nitrate) that we are so familiar with'¦ And these fishes must have not only a large volume of water for dilution effect, but vigorous water movement and over-sized filtration to remove such readily. 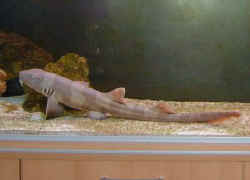 The Black Tip Reef Shark, Carcharhinus melanopterus requires a much larger sized system than a home aquarist can supply'¦ on the order of a good sized swimming pool in gallonage and shape'¦ Even small specimens suffer from being put in smaller settings, living miserable lives for a few months at most. Happily there are some true sharks that though not as active, can be much more readily kept in smaller, hobbyist set-ups. Most celebratedly these are members of the Epaulette and Bamboo Shark family (Hemiscyllidae), some of the Cat or Swell Sharks (Family Scyliorhinidae) and a few of the Port Jacksons and Hornsharks (Family Heterodontidae). Do be aware that these fishes also require the aforementioned 'heavy duty' gear to keep their water clean and clear'¦ and that they are a long-term and expensive commitment'¦ Living for years, consuming good quantities of meaty marine food items, and requiring a good deal of regular system maintenance all told. 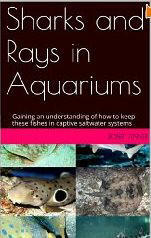 What's more, in this brief expose, I'll mention that there are restrictions in what you can further stock with such fishes'¦ There is much to consider when thinking of keeping a shark. <Please start reading here: http://www.wetwebmedia.com/sharks.htm and follow the links (at the top) to the "Shark Selection" et al. FAQs files. Bob Fenner> thank you. Shark in a 70g? <Lorenzo standing in for Bob-in-Asia> Question: I have a 70 gallon salt tank that is currently being set up. I have about 2 yrs experience in marine fish keeping and now need some advice on what shark I could keep in the 70 gallon. Any info will be greatly appreciated.